2-player cooperative 2-D platformer game made in LOVE2D by fredriclam @ Stanford Fall Game Jam 2018, themed fall. Hold out on a strange platform as you get attacked by alien shards of red and blue. 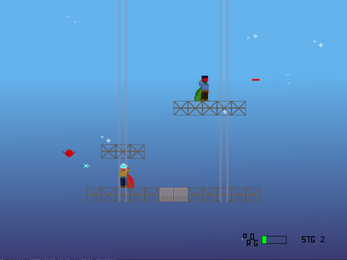 The catch: each player can only shoot down one of the two types, so you have to depend on your cooperative partner. The goal of this project was to explore LOVE2D as an option for developing a 16-bit style MOBA, and to celebrate open source! Sounds produced on BeepBox. Made using only hand-rolled asset and code, on an open-source framework. Inspired by the likes of Rockman and Risk of Rain. Fueled by coffee and bubble tea.